Allow employers to enter into limited non-disclosure agreements narrowly tailored to protect their trade secrets. This legislation is doomed to fail from the get-go. If you scroll down to the end of this article, you'll see why. But before we get to that, we first need to see what the most significant provisions of the Act are. SEC. 2. 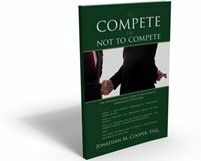 PROHIBITING COVENANTS NOT TO COMPETE. (a) In General.—No employer shall enter into, enforce, or threaten to enforce a covenant not to compete with any employee of such employer, who in any workweek is engaged in commerce or in the production of goods for commerce (or is employed in an enterprise engaged in commerce or in the production of goods for commerce). SEC. 3. DEPARTMENT OF LABOR ENFORCEMENT. (a) In General.—The Secretary shall receive, investigate, attempt to resolve, and enforce a complaint of a violation of section 2 in the same manner that the Secretary receives, investigates, and attempts to resolve a complaint of a violation of section 6 or 7 of the Fair Labor Standards Act of 1938 (29 U.S.C. 206 and 207), subject to subsection (b). (2) with respect to any employer who violates section 2(b), in an amount not to exceed $5,000 for each week the employer is in violation of such section. (a) In General.—An employee who is aggrieved by a violation of section 2 may bring a civil action in an appropriate district court of the United States. (3) for an employee that is a prevailing party, the costs of the action and reasonable attorney’s fees, as determined by the court. Nothing in this Act shall preclude an employer from entering into an agreement with an employee to not share any information (including after the employee is no longer employed by the employer) regarding the employer or the employment that is a trade secret, as defined in section 1839 of title 18, United States Code. It remains extremely early in the process to ascertain whether this proposed statute will ever become the law of the land. That said, the extremely broad nature of this proposed legislation is both puzzling and concerning on policy grounds. For example, considering that many, if not most, states have concluded that there are a litany of circumstances where an employer has a legitimate business interest in holding employees to a restrictive covenant, and there are compelling economic and policy reasons for using a balancing test, what new compelling research has come to light that would compel Congress to upset that proverbial apple cart? Indeed, by broadly outlawing these agreements, it seems employers would be disincentivized to invest in training their employees, which hurts the general consumer - and the employees' future employment prospects. While Congress is to be lauded for its concern about employees' welfare, this proposed legislation is overly simplistic and overreaches, as it utterly fails to address legitimate employer concerns in a meaningful and productive way, making it all too prone to attack by different-minded, more pro-employer politicians. In other words, it's extremely hard to take this proposed legislation seriously, at least in any manner that anyone on the opposite side of the aisle would feel compelled to sit down and reach some sort of compromise. Therefore, I believe this proposal may actually prove counterproductive, at least in terms of getting results for employees. Post a Comment to "Why Workforce Mobility Act's Noncompete Ban Fails - Badly"